The sixty-seven verses describing how Rebekah becomes Isaac’s wife indicate the writer believes this story is extremely important. Abraham is very old, and Sarah’s death has made him concerned for the next generation of the divine covenant. Calling his chief servant, he instructs him to find a wife for Isaac in his homeland of Mesopotamia. The ancients think quite literally, so when he seeks assurance that his servant won’t bring back a Canaanite to corrupt the covenant lineage, Abraham asks him to place his hand under his thigh—the seat of procreative powers—and swear by the Lord that he will select a woman from Abraham’s relatives. Then he adds that the Lord will send His angel to indicate who that might be. 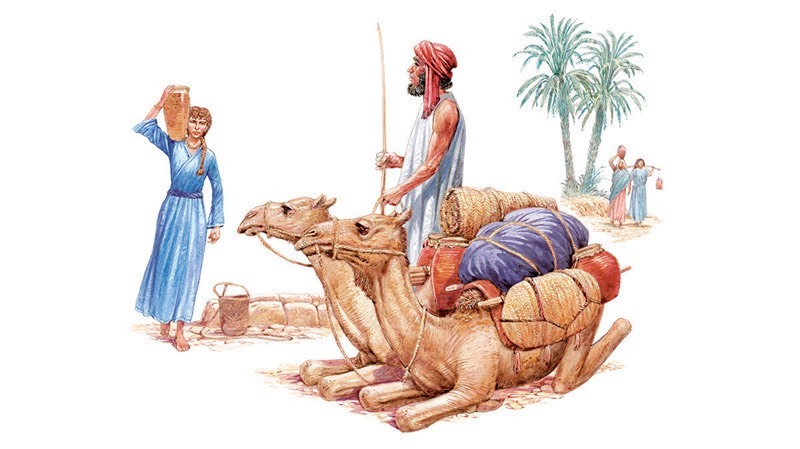 The servant begins the 500-mile journey to Nahor ( a city named after Abraham’s brother) on ten camels—a rare and luxurious mode of transportation at that time. After several weeks he arrives at the city’s well, and asks the Lord to indicate the right woman by having her give him a drink of water, and offer to water his camels. Rebekah descends the steps to the well, draws about three gallons, and climbs back up to the watering trough. She repeats this until each animal has had its fill—and considering a thirsty camel can drink up to 25 gallons, she may have made more than 80 trips! The servant watches silently, making sure this is the Lord’s chosen one. Then he gives her jewelry as a token of his appreciation. “Whose daughter are you?” he asks, and she answers that her father is Bethuel, son of Milcah, the wife of Nahor. Then he asks if her father’s house might have room to lodge him, and when she answers yes, he bows his head and thanks the Lord for bringing him to his master’s relatives. Rebekah runs home, and soon her brother Laban (who’s probably blond or an albino, since his name means “white”) runs back to meet the servant. Undoubtedly impressed by his gifts and camels, Laban invites him home and offers him food. However, Abraham’s servant will not eat until he recounts his mission and journey, and that Isaac will inherit great wealth and support Rebekah well. Then he falls silent. “The thing is from the Lord,” Laban and Bethuel say. God has pointed out Rebekah—and they dare not oppose Him. Detailed negotiations follow about the bride money to be paid her family, and Rebekah is given more silver and gold jewelry, as well as fine clothing. Her brother and mother also receive valuable gifts. Although her family begs her stay at least ten days, the servant is anxious to leave in the morning. So Laban asks Rebekah to make the decision, and after a family blessing, she leaves immediately. The Bible is short on Isaac’s wedding details, focusing instead on the fact that when they married, Rebekah comforted him on the loss of his mother. Much can be said about arranged marriages, but in this case Isaac’s heavenly Father was the one who chose his wife—and God never makes mistakes!